"We understand the need to rebuild politics"
In this page, Sâmia Bomfim addresses these topics. 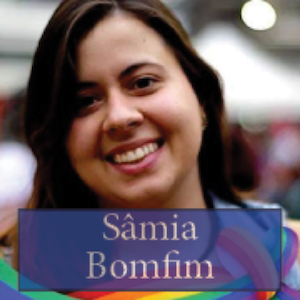 Sâmia is a Brazilian activist focusing on human rights and women's movements with experience in building bridges between social movements of various causes. Member of the PSOL, she is a councilor in the municipality of Sao Paulo for the candidacy Bancada Ativista. Considering what politics is in Brazil, I believe that our Bancada Activista candidacy does indeed have some elements of innovation. In the way of doing politics, however, I think that it is more of a rupture than an innovation, because it is something completely new. The usual relationships in politics here are very fraudulent, and financial and economic power totally dominates them: it buys representation, political position, chooses candidates and the causes to defend, and those not to defend. So, in that sense, I believe that the Bancada represents a complete break with what is considered to be normal in Brazilian politics. We understand the need to rebuild politics, to elect representatives, parliamentarians and figures that are part of specific causes, of social movements, of specific niches, of social groups organising for particular purposes and demand changes in society. In that sense, our option represents a rupture. But it is also true that, in certain respects, it is also an evolution. From the very beginning in the history of humanity, people have organised themselves, they have come together to try transforming things - and that is what we are now trying to do: uniting people, so that they can claim their rights. Only, this time, we want to do it within the political institutions. And this is where we can talk about innovation: what we are doing is bringing what already exists in society to spaces where it was not present before. In this sense, we can say that our political option is a mixture of rupture and innovation. One of the main problems of Brazilian politics is the lack of alternative options, of tools with which to challenge power. Especially when there is polarisation between two major parties: the PT and the PSDB, the old left and the old right. Both are involved in the same schemes, defend the same political platform, have the same figures, the same completely worn out leaders. We do not have a third party representing a front of movements, groups, social organisations that can challenge power. This has to do, I think, with media coverage, which is very much oriented by what happens in the United States - bipartisanship - and tries to transplant the same dynamics in Brazil, as if there were only two possibilities. But it also has to do with the Brazilian electoral system. We do not have independent candidates, there is no such possibility, it is very difficult for a candidacy without big money behind it to get elected. This is indeed very anti-democratic, because the power-wielders end up electing their representatives, while people from social movements cannot reach that party structure. Even the most democratic, most progressive parties still have “bosses” in Brazil – we call them caciques, which is a term that originally referred to the indigenous communities’ chiefs. The parties still have their caciques, the big names in politics, and this is an endemic dynamics to the way politics is done in Brazil. I think social leadership experiences like mine, like that of Áurea Carolina, like those spontaneous movements in the cities, need to be courageous and try to pierce the blockade and occupy politics, because there are examples that show that it can be done. Brazil has opened up a discussion on political reform. Some proposals could make it difficult, but others can help. For example, the question of whether the district vote should be allowed or not. That is currently being discussed in Brazil but, at the same time, they want to eliminate small parties, such as PSOL, for example – that is my party. So, people like me, where would they go? How would it be possible for us to campaign in this two-party challenge, dominated by their caciques? On participation, democracy and leadership, we find ourselves today at a crossroads. There is a crisis of representation, an economic crisis, and a discrediting of politics. So, our challenge is to get people to discuss the directions this political reform should take, at a time when people do not trust politics. That is the challenge: to regain confidence. And, for that, we must bring new people to the institutions.